Now, with this config, everything is working fine. Note that the root directive is commented out. If I activate root and deactivate the alias -- it stops working. However, when I remove the trailing /static/ from the root it starts working again. Can someone explain what's going on. Also please explain clearly and verbosely what are the differences between root and alias, and their purposes. I have found answers to my confusions. There is a very important difference between the root and the alias directives. This difference exists in the way the path specified in the root or the alias is processed. In case of the root directive, full path is appended to the root including the location part, whereas in case of the alias directive, only the portion of the path NOT including the location part is appended to the alias. Your detailled has been of a great great help! Thank you very much ! The trailing slash on the alias path is essential! OMG, thank you so much that last slash costed me half a day. Thank you so much! This silly error had wasted me two hours. This is all great (it helped me fix my config issues), but I wonder what logging settings people could use to help diagnose these kinds of problems? 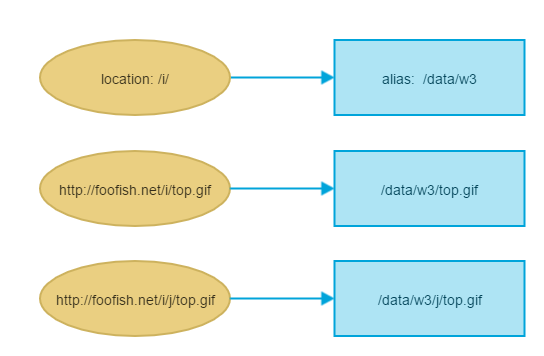 Like, anything that would print to logs stuff like "received request for [...], matched by "location [...]" config block, searching directory [...]"
@Pistos: put log_format scripts '$document_root | $uri | > $request'; into http section and access_log /var/log/nginx/scripts.log scripts; into server section of nginx config.. Thanks! Indeed the trailing slash is essential on the alias, otherwise i got nginx: [emerg] invalid number of arguments in "alias" directive, and the server went down during its restart. In your case, you can use root directive, because $uri part of the location directive is the same with last root directive part. and root directive will append $uri to the path. Why is it better? Docs don't say either. Server block to live the static page on nginx. Should the first arrow in the second image be a "+"? 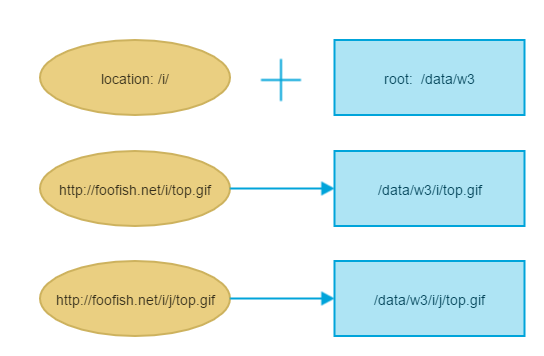 Just a quick addendum to @good_computer's very helpful answer, I wanted to replace to root of the URL with a folder, but only if it matched a subfolder containing static files (which I wanted to retain as part of the path). For example if file requested is in /app/js or /app/css, look in /app/location/public/[that folder]. I got this to work using a regex. Thanks for this answer. I know this is 3 years later, but could anyone explain if there is a performance and/or security tradeoff between using alias versus root?